I doubt there's many cities with that many ready to build lots fronting rail + bus transit AND at a major interstate AND is centrally located AND is where people want to move to. it's like the large empty piece of land just north of NKC. It's the kind of thing we want to remain undeveloped until a company that can self fund wants to develop it as modern and dense. "Local team will design, build Sungevity's new KC space"
"He said that exploratory work is underway and that the build team wants to start before the end of the year. Greensfelder, the owner's representative on the project, said Oakland-based Sungevity is looking to move into the space by the spring." 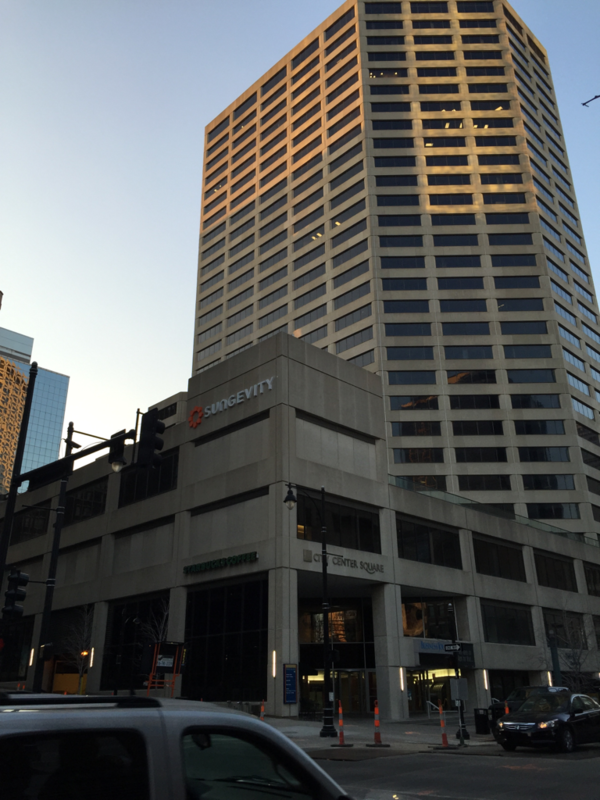 The Sungevity signage has been installed on the south side of City Center Square, at the mezzanine level. herrfrank wrote: The Sungevity signage has been installed on the south side of City Center Square, at the mezzanine level. This is a very positive sign for the City to have a new company come in and surpass its hiring goals in only a couple of months. Susan Hollingshead spoke at MOTM panel session on their experience coming to KC as a new business. They were incredibly happy with KC and the talent pool. It sounds like they will be hiring close to 500-600 employees over the next several years. She spoke along side the law firm that just moved their back offices here and are in the process of hiring something like 300 people. It was very interesting to hear their perspective on KC and the process of selecting KC. They both gushed over DT and our architecture in general. When asked what were the negatives for KC- the law firm guy replied "the airport". The Sungevity lady said, "Transportation, transportation transportation." She also added that right or wrong- people on the coasts know nothing about the midwest- some people hear kansas city and think its Ferguson, Missouri... Its something they both said just takes us being our own cheerleader and getting the word out. Its so nice to see actual job growth from incentives. This, combined with the nearly 1000 people or so Cerner will hire annually, is going to put KC on a strong tech trajectory for several years. I'm interested to see what other major businesses are waiting in the wings to make an announcement about jobs coming to KC. There is a lot of momentum right now. Thanks for the recap kboish, that's very heartening to hear. In response to the negatives, certainly the airport is in dire need of, at the least, a major renovation/modernization. It is embarrassing. Not sure how to increase the availability of flights into and out of KC, however. Unfortunately, with Brownback to the west and Ferguson to the east, there's not a whole lot we can do about the "national image" thing, but then that has always been issue to varying degrees in old flyover cowtown KC. I would think we would get a lot more relocations from more expensive cities just based on our commercial per square foot rental prices alone. Especially back-office and auxiliary functions that can mostly be done on computers and phone. I wonder sometimes if the EDC would do better just printing a weekly ad in the Business Journals of some of the more expensive cities advertising our commercial Class A and Class B office space. Then list our amenities (lyric opera, symphony, ballet, repertory theatre, fine art, msueums, sports facilities, or headlines from those lists (coolest city, best food, best entrepreneurial city, etc. ); and the average apartment rents/home prices for their employees. rxlexi wrote: Not sure how to increase the availability of flights into and out of KC, however. Seems pretty straightforward: increase demand. How the heck does Austin have a daily direct flight to London on BA? I don't really know. That it's the capital of a large state with an overwhelming energy industry presence probably doesn't hurt, but that can't be all of it, can it? FangKC wrote: I would think we would get a lot more relocations from more expensive cities just based on our commercial per square foot rental prices alone. Especially back-office and auxiliary functions that can mostly be done on computers and phone. I wonder sometimes if the EDC would do better just printing a weekly ad in the Business Journals of some of the more expensive cities advertising our commercial Class A and Class B office space. Then list our amenities (lyric opera, symphony, ballet, repertory theatre, fine art, msueums, sports facilities, or headlines from those lists (coolest city, best food, best entrepreneurial city, etc. ); and the average apartment rents/home prices for their employees. what are the downtown apartment and class a rents? I don't know them off-hand, but I'm sure the EDC would know. Loftguy, do you have the averages? pinsight media is moving into CCS on monday from 909 walnut. entertainment properties trust (AMC real estate arm) is taking their old space, so they will now consume all of the commercial space in 909. Domino's is open (or very close) on the ground floor and Brightergy Sungevity is cutting 2/3 of its staff. Can confirm Domino's is open, as we got a pizza Saturday night. In case anyone's curious, they're open (for both delivery and carryout) until 1 AM Sunday-Thursday and 3 AM Friday - Saturday. DaveKCMO wrote: Brightergy is cutting 2/3 of its staff.